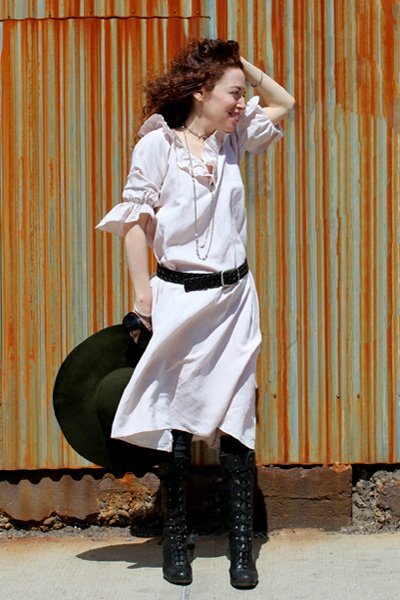 Meet Sarah Kate Beaumont from verysweetlife studio: an interdisciplinary artist based in Brooklyn, New York. Beaumont’s work offers an alternative perspective to the consumer. She addresses sustainability and ethics through her writing, photography, and wardrobe design. Her work explores acquisition, stewardship, and the relationship between human and what we own, within a shared ecosystem. She has been profiled in publications such as The New York Times, The Wall Street Journal, Yes! Magazine, Bloomberg Businessweek, as well as international coverage with Ultimo Segundo and Naciòn. Beaumont’s work is also profiled in books, “Overdressed: The High Cost of Cheap Fashion” by Elizabeth Cline and “Routledge Handbook of Sustainability and Design”. The Studio is excited to have Beaumont as one of the artists and instructors for the upcoming summer. She will be teaching the workshop, “Mending for Sustainability” on June 2nd, 2018! 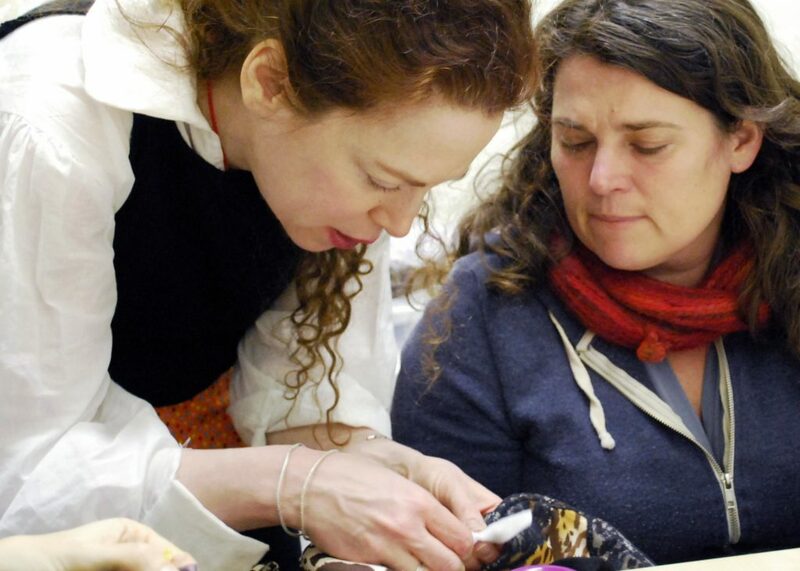 This useful and engaging afternoon workshop (1 – 3PM ) will guide you through steps to mend and repair a beloved garment. CC: What is your artistic background? Sarah Kate Beaumont (SKB): I began my artistic career as a professional photographer and traveled the world to explore how humans live within a wide variety of circumstances. When digital imagery replaced film, I gravitated towards fabric and thread, which is another analog practice. 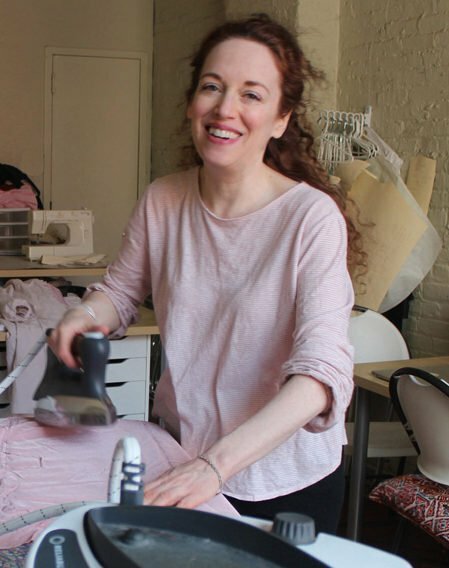 As an educator, I taught art in New York City public and private high schools for a decade and started running a sewing school for children and adults in my Brooklyn design studio in 2008. I also served as an organizing member and the resident master seamstress of Fixer’s Collective, an improvisational repair collective. CC: Would you share how you started your Slow Style project in 2008 and continued to make your everyday clothes today? SKB: During the 2008 financial crisis, I thought to myself, “why should I buy clothing? I know how to sew. I teach students to sew. I will make my own.” It was a small seed that yielded a garden! I started Slow Style that year and continue to practice it now. I opted out of buying clothing. Instead, I designed an entire wardrobe, making virtually everything I wear from lingerie to hats. I make jewelry, hats, undergarments, clothing, and outerwear. Everything except shoes and socks. Slow Style delves deep into craftsmanship and embraces the ethos of makerism. The practice of mending is integral to this work. The project extends out into a series of informal community gatherings, Mending Basket, which the public is invited to bring garments in need of mending and learn the skills to restore them. At the heart of my work is an exploration of the individually made vs. the mass-produced. CC: Why not shoes and socks? SKB: I explored shoe making and quickly realized constructing quality shoes was going to be costly. Also, it allowed me not to become a fundamentalist when it comes to what I wear. Buying the occasional pair of socks and shoes is enjoyable. CC: Did you miss buying clothing? SKB: Not at all! I discovered a well of joy that comes from making what I need. CC: Can you share a story about the joy you found through making your own clothes? “Did you? !” she responded with warmth and enthusiasm. The child told her about being a visitor in a kindergarten class. His father had moved toward the exit and was waiting a few yards away while the boy lingered, excitedly sharing a little more about his day in kindergarten to the receptive cashier. He then ran to join his father. As I moved in front of the counter I had an impulse to tell the cashier, “I made my first tee shirt today!” I felt as much glee as the boy did. New adventures and discoveries are exciting whether one is four or forty. CC: Sounds like you are enjoying the learning process. SKB: You know, that’s true. There have been moments when I feel like an expert: I’ve made corsets and other complex, historically-based designs, developed what I think are pretty innovative patterns for belts, and made leggings with Italian wool knits that look more sophisticated than most knits). I’ve also had moments when I wrestle with what I don’t know — when designing something completely new or working with materials that are tricky to handle. There has definitely been some frustration along the way. CC: What do you do when you are frustrated in the middle of your work? SKB: Take a walk. Seriously, that’s one of the best approaches. There was a jacket that had complex design/sewing issue at the last stage before completion. I tried over and over again to solve it; probably spent a week trying different solutions. Finally, I put the jacket away. A year later, I was reorganizing my studio and took out the unfinished jacket. I finished the jacket in a day. It was an amazing reflection on how much I had developed as a designer in the interim. In this instance, I believe Malcom Gladwell is right about the 10,000 hours required to become an expert; sewing every day does that. Another suggestion, when a project gets too hard and your frustration isn’t productive, turn to making something simple. I like to sew a pair of pajama pants. Very quick, satisfying and reaffirming of one’s skills. CC: How much is mending a part of your process? SKB: Mending is integral to the Slow Style project, it adds another layer to any garment. It’s a way of tending the garden one has grown (whether by making something or acquiring it). After cutting and sewing a garment together, I wouldn’t let stains or snag cause it to become useless. I truly believe that we have a relationship with the objects and the environment in which we surround ourselves. It is up to us to maintain what we own and refrain from adding waste where it can be prevented. My grandmother had a few maxims and one of them was, “waste not, want not.” It’s a good one. A student in one of my mending workshops remarked that mending something personalizes it. I agree. Once you’ve mended an item, it is no longer like any other. 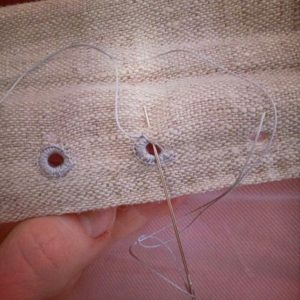 CC: What is the most unusual item that you’ve helped someone mend in your mending workshops? SKB: A woman brought in a bra that has its underwire poking out and was pleased she able to mend it. Bras are expensive! A man brought in his favorite jeans that his wife hated. I helped him patch the large holes in them. Hopefully it made them less offensive to his wife. People can love items of clothing with devotion. CC: What do you want to tell people about mending the clothing they own? SKB: It doesn’t need to match or even look beautiful, but it has to function well. Sometimes the most clumsy mend is gorgeous. Often the fabric I use for a patch isn’t the same as the one I used in the original garment, the combination enhances rather than detracts from its appeal. Also some mending is really quick. Sewing on a button takes a couple minutes. We can have a more sustainable lifestyle by mending textiles, preventing them from being discarded and ending up in landfills. The mending workshop is an opportunity to learn from each other and share skills. A lot of the items we repair have stories behind them and hearing those stories is one of my favorite parts of the mending workshop! CC: At the end of this interview, any final thoughts you would like to share? SBK: When you buy, satisfaction is instantaneous, but tends to fade. When you make what you use and wear everyday, the joy grows and you start to develop your skills. The process of making is energizing; It shows the evidence of your time, your learning, and your imagination. Making is breathing through the hands. I hope everyone will enjoy themselves as they learn to mend the item they loved and finish with a sense of accomplishment! Below is one of Beaumont’s video and tutorial on Mending: Sewing a Patch. You can learn more ways to mend the clothes you loved in Beaumont‘s June 2nd workshop “Mending for Sustainability”! 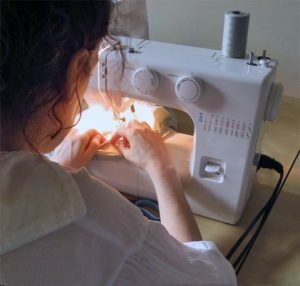 Bring a piece of clothing to class that needs to be mended, whether it has been torn, moth-eaten, has an unstitched hem, or is missing buttons. Beaumont will guide you through the steps of clothing repair. If you would like to keep up with what Beaumont is doing, visit her at her website and on instagram @verysweetlife! All photos and video in this post are courtesy of Sarah Kate Beaumont.